Hooked on Needles: Quilted Tote Bags with Zippered Extension ~ Two Ready and Waiting! Quilted Tote Bags with Zippered Extension ~ Two Ready and Waiting! It's no secret to my regular readers that I love bags. Designing bags, making bags, using bags, owning bags...I am truly a bag lady! There's just something about a nice bag that is just right for holding whatever stuff you need to haul around with you. And if it's made out of nice fabric, all the better! Here are two quilted tote bags that I just finished making. Each has an outside pocket, a divided inside pocket, a D-ring for clipping things to, a swivel clip on a strap inside to keep track of keys, and a zippered extension which allows the bag to become even bigger than it already is! Each bag is made from top quality quilting fabric with a base of sturdy corduroy, and fully lined. 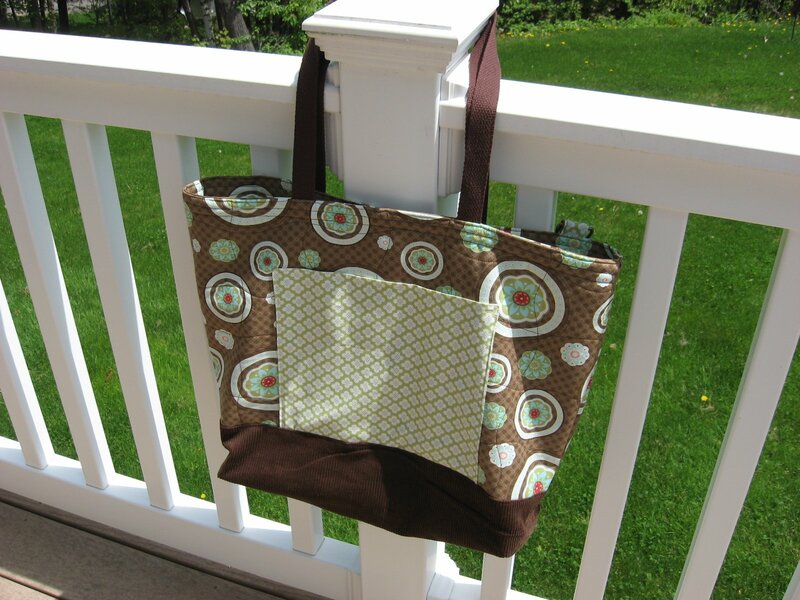 This bag is made with the fabric line Bliss by Bonnie & Camille for Moda. The medallions on the brown fabric are just gorgeous up close! The lining of this bag is the same fabric as the outside pocket. 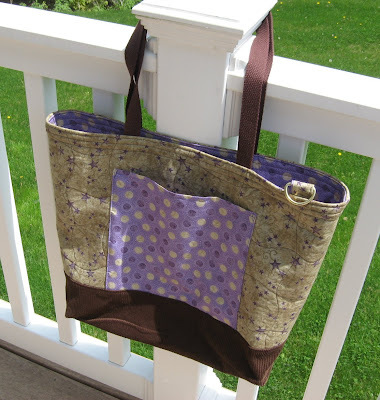 This bag is made using the fabric line Lilac Parade by The Buggy Barn for Henry Glass & Co. The lining fabric is the same as the outside pocket, gorgeous soft purple with purple and tan dots. If you'd like to see more pictures of these two bags, head on over to my Etsy shop and click on one of the bags. There are also a few other tote bags over in my shop that are not quite as detailed, and made with upholstery fabric instead of quilting fabric. So if you're looking for a nice tote bag, you've found the right place! Coming up next will be a look back at THIS crocheted mitered square baby blanket with a video tutorial for a particular part of the instruction that one of my readers is having trouble with.